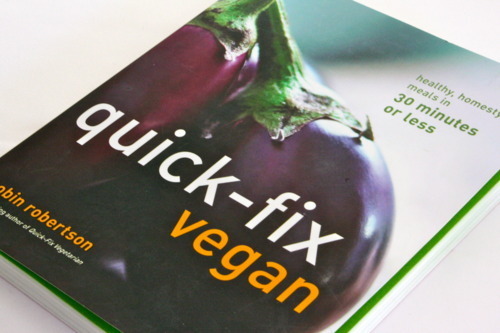 After reading & falling in love with Robin Robertson’s “Quick-Fix Vegetarian”, which I recommended here, I waited with hasty anticipation for “Quick-Fix Vegan” to arrive. A month or so ago it finally fell into my hot little hands. It is brimming with quick, easy, & satisfying recipes that will put a lovely vegan feast on your table in a flash. Robin’s mouthwatering recipes draw upon many ethnic influences including French, Mexican, Cajun, Moroccan, Mediterranean, Asian & more. From seasoned culinistas & home chefs, to students, kids & men, to tried & true vegans & the veg-curious, there is a recipe for every taste & skill level in this book. Quick-Fix Vegan is packed with 150 fast & easy recipes for putting delicious, healthy food on the table in 30 minutes or less. There are so many things that I cannot wait to make. Ummm, tiramusu & creme brûlée? Two of my all time faves. Yes, please. Perhaps I’ll do another review of the dessert chapter? 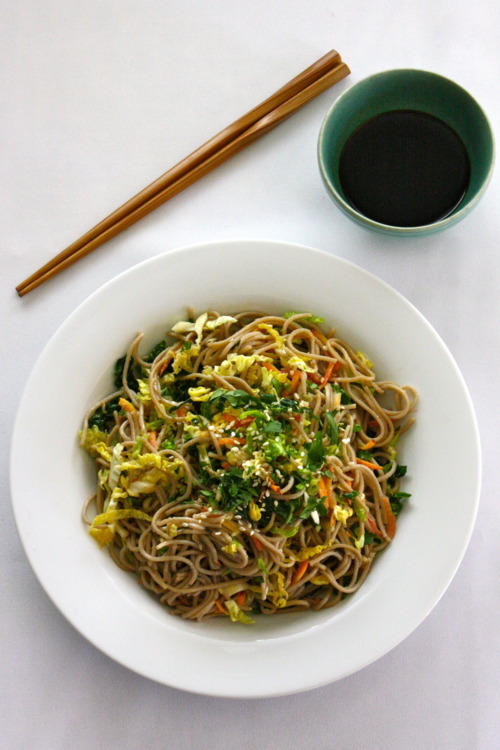 For this post, I chose the the “Soba Slaw” to review & share because I love, love, love soba noodles, & I’ve been receiving cabbage galore this season. You all know how I usually feel about cabbage, so why not combine something I love with something I…tend to loathe… & see if I can break this cabbage bashing spell? 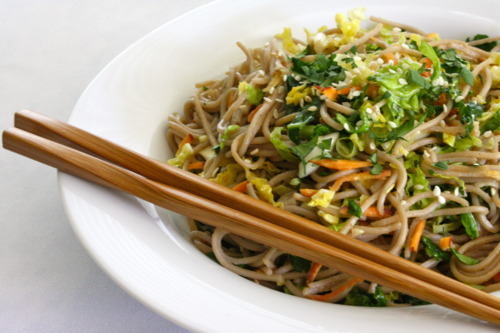 This recipe combines hearty buckwheat noodles, shredded cabbage, carrots, ginger & herbs with a tangy sauce – giving it wonderful texture & flavor. Chewy soba noodles provide the backdrop for this satisfying slaw, bursting with color, texture, & flavor. If you prefer a spicy slaw, add a teaspoon or so of sriracha sauce to give it some heat. Cook the noodles in a pot of boiling salted water until tender. Drain & run under cold water, then transfer to a large bowl. Add the cabbage, carrot, scallions, cilantro, & ginger. Set aside. 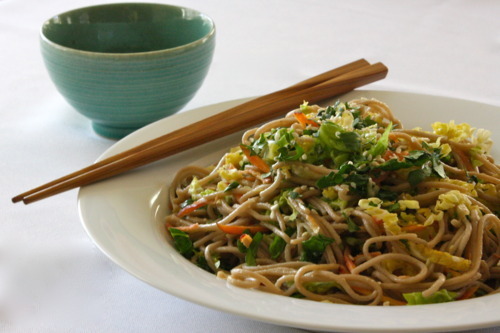 In a small bowl, combine the vinegar, vegetable oil, soy sauce, sesame oil, sugar, & salt to taste. Stir until well blended. Pour the dressing over the noodles & vegetables & toss gently to coat. Taste & adjust the seasoning. Sprinkle the peanuts on top. Serve at once, or cover & refrigerate until needed. I made a few simple modifications for my preparation. I prepped the cabbage in a food processor with the shredding blade (I used a small savoy cabbage) & it created a fine shred that was perfect for this dish (however, might be too fine for a coleslaw type salad). I incorporated the ginger in the sauce & also swapped out the sugar & replaced with agave. Next time I might even throw in a clove or two of minced garlic. I thought the addition of sriracha sounded awesome, so I reached for it & realized I was out! Oh no, but I’ll be trying the spicy version next time for sure. I substituted sesame seeds in place of the peanuts, as it was what I had on hand. I also think slivered chopped almonds would be nice. 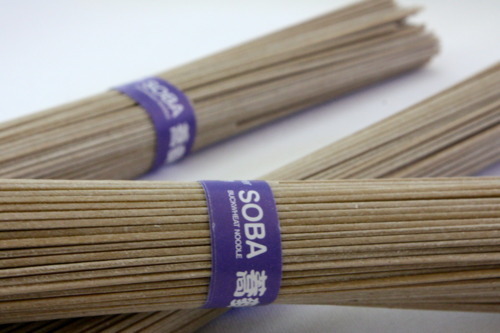 I went a little heavier on the soba (10 oz) to help balance out drown out cabbage (haha! ), & did find that I needed to make another 1/2 batch of the sauce.